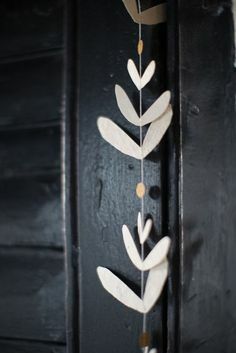 I really enjoyed working with cement for this votive DIY I did a while ago, and have been trying to think of a way to use it again in a new way.. and then these decorations popped into my head! Perfect! 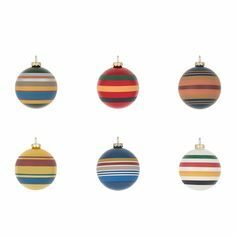 Don’t you think they’d look great hanging on a Christmas tree? They’re super cute, and so so easy – you could make them in any shape you like (as long as you can find the mould!). Use a brush (or fingers) to apply a thin coat of vaseline inside of each moulds. Put some of the dry cement powder into the disposable cup (fill about 1/3 of the cup). Gradually add water to the powder, stirring as you go (with the disposable stick), until you reach the consistency of melted ice cream. Transfer some of the cement mixture into the moulds, and gently tap the mould against a table to spread the cement. Add more cement until it’s full, and keep tapping the mould to release any air bubbles. Leave the mould to dry. Once it’s been drying for 1/2 an hour – an hour, cut the straw into pieces (longer than the depth of the cement you just poured). Carefully push a length of straw into the top of each ornament until it’s touching the bottom – this will become the hole for the ribbon. Now you’ll want to leave the ornaments to dry over night. 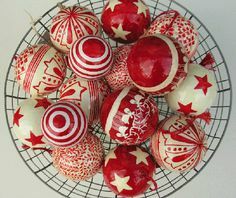 After the ornaments have dried overnight, carefully pull them out of the mould. Twist the straw out, and don’t worry if it’s not a clear hole the whole way through. Now leave them to dry for another day. Sorry, I know it’s long, but it’s necessary! Now that your ornaments are fully dry, use some sandpaper to sand both sides and smooth off the edges. If the hole isn’t quite open, use a drill to carefully drill through the cement and open it up. Although I really love the beautiful simplicity of the ornaments above, I also thought some gold could be nice too! So I bought a gilding kit, and got to work :) I’ve never gilded anything before, but with the right tools it was quite easy! And very effective – just follow the instructions that come with the kit you buy. This kit is the one I bought. Wow!!! That is amazing! I am almost jealous I didn’t have this idea myself!!! I soooo much love concrete! Brilliant!!! Oh, Claire! These are wonderful! What a simple idea but so effective! I’m absolutely going to have to find time to do this! So pretty!! I love the little bit of gold you added. I have half a bag of cement and lots of moulds! No idle moments this week end! Where did you get the mold from? I love this! 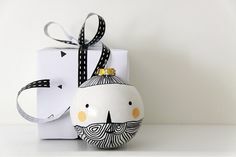 I’m crazy for the ceramic ornaments that are taking over Christmas this year… these are a fun update! Love these, made these, even ordered the same gold leafing that you used. 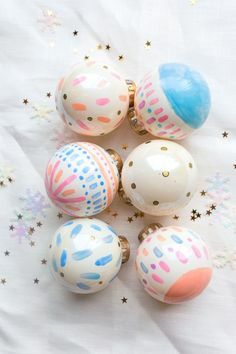 They are easy and fun to make. I am just having trouble with the holes! I can’t get the straws out so I have perfect tree ornaments with a straw stuck in it and no way to hang it….help? 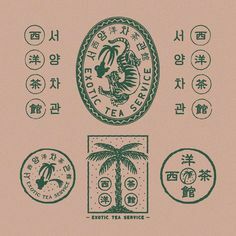 Advice? Love the gold edge detail. Better start looking for some Christmassy moulds! Wow …. it’s a great idea. The ornaments were beautiful. Would Love To Know the name of the shop that you bought the Silicone soap Mold – Basic Christmas Tree Soap Mold, Please advise. Hi there! Just wondering where did you buy the cement powder? Can’t find it in the hardware stores around my estate! Thanks! can i use unsanded grout for this? Hi Diane, I’m afraid I don’t know as I’ve never had any experience with grout! Sorry I can’t be more help! 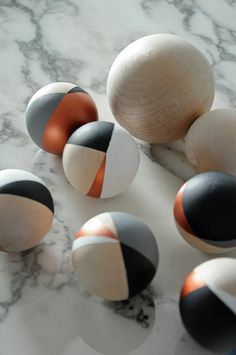 So pretty – I just love these cement ornaments! I love the cement ornaments!! Where did you find your cement powder? Thanks! I love this idea. Being in the concrete industry, this would make a great gift for our clients. Thanks so much for sharing! I would love to make these with my 3rd graders. Would you be able to be more specific on the measurements for the water and cement? I want to create a science/math lab for them. I was just wondering if you know any specific hardware stores that sells cement powder? i’ve tried looking around but couldn’t find any. Hi syyx! So sorry for the late reply – I’m afraid I’m not sure of which specific hardware stores would sell it – though I’d thought most would. I can’t even remember where I got it either. Sorry I can’t be of more help!